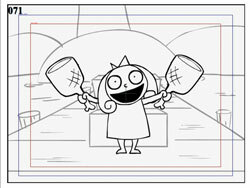 After the animatic is finished, the show is ready to be animated. Color characters are put in to the scenes, and their poses are matched to the animatic. The animators animate the frames between the poses in the animatic with the help of storyboard notes. The final backgrounds are also added at this time. When the animation is complete, scenes are edited together so that the final timing of the episode can be adjusted and finessed. Right: A frame from an animatic, and a finished frame of animation. Hooray for ham! After the animation is finished, Ego Plum writes music to go with many of the scenes. 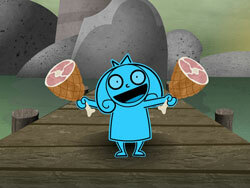 Also, foley and other sound effects and are added- like footsteps and the sounds of exploding hams. 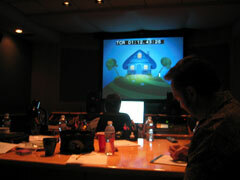 The sound effects, music and dialogue is all put together with the animation in a final sound mix. Then the episode is ready to be screened! Left: A sound mix for Making Fiends at Salami Studios.